Why Do You Ride Motorcycles? I continue by saying… “Pictures are worth a thousand words” but pictures can’t capture the experience. Riding a motorcycle must be experienced to fully know what it is really about. To different people riding means different things… Ask any rider and you may hear similar themes but they are all different. We all have our reasons and the common thread is our motorcycles and even the bikes can differ… scooters, sport bikes, cruisers, touring, dual sport and the list goes on. Have you ever driven pasted a road many times and wondered where it went, never venturing beyond that thought? When traveling by motorcycle (Touring) it seems that you always make the turn and travel that road, not knowing where it may lead. That’s the allure of riding. It is always an adventure. You are out there in the elements, feeling the sun, wind, heat, cold, and rain and smelling all the smells along the way. Spring flowers, food cooking, rain in the distance etc. all the out-door smells… yes, skunks, dead animals etc. too. Some of the most beautiful scenery we have experienced has been while traveling by motorcycle. Riding a motorcycle and traveling is like a “chicken or the egg” relation. I’m not sure if we travel to ride a motorcycle or if we ride to travel. Traveling by motorcycle is cheaper than traveling by car. Public transportation ties you to dates and times that are not of your choosing. Riding is being free. Riding is great therapy. When stressed or I just have a lot on my mind, I can jump on the motorcycle and start riding not having a clue where I am going except that I am going for a ride. My thought shift to where to and what’s over there. Before long my mind is clear and I’m just enjoying the ride. 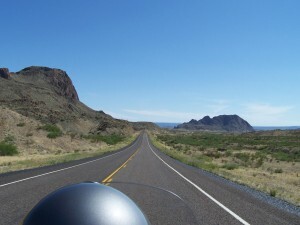 Everything you wanted to know about us… the Texas Rambler motorcycle travel blog and more. Have you ever driven past a road many times and wondered where it went, never venturing beyond that thought? When traveling by motorcycle it seems that you always make the turn and travel that road, not knowing where it may lead. That’s the allure of riding. It is always an adventure. You are out there in the elements, feeling the sun, wind, heat, cold, rain and smelling all the smells along the way. Spring flowers, food cooking, rain in the distance etc. all the out-door smells… yes, skunks, dead animals etc. too. Some of the most beautiful scenery we have experienced has been while traveling by motorcycle. Over the years we have taken many motorcycle trips. Friends have asked that we share these trips with everyone who may be interested. Thus the start of this blog. We hope you enjoy it as much as we do sharing it with y’all. Janet & I (Ivan) have been retired since June 2002. We try to travel as often and cheaply as we can. In 2000 I bought a Kawasaki Vulcan Nomad and renewed my love of motorcycle riding. In 2009 I bought a Honda “Goldwing” with all the options except the airbag. The Goldwing is the Cadillac of touring bikes and we love touring on it. Many of our trips we have taken have been on the motorcycle but we have taken many other trips also. My main interest is motorcycle touring but we will also share our other adventures here also. Over time we have learned many things that have made our trip more enjoyable and we will share those tips with you here. Keep checking back for all the updates. P.S. Please, take the time to subscribe so you don’t miss the latest post or if you know someone who rides and might be interest please email them a link.